Policies marked with an asterisk (*) were singled out in a recent National Complete Streets Coalition analysis as particularly strong model policies, with Crystal City's ordinance ranking among the very highest in the nation. A Complete Street is one that is designed with all users in mind--motorists, pedestrians, bicyclists, transit users, the elderly, and the disabled. Making streets usable for everyone promotes sustainable transportation, active lifestyles, and safer access to jobs and school. It directly impacts problems like childhood diabetes, obesity, simple justice (freedom of movement for everyone), air quality, water quality, and climate protection. It helps make communities vibrant, healthy, economically strong, and appealing to residents, visitors, and employers. There is strong citizen support statewide and nationally for Complete Streets. Fully 94% of Midwesterners support maintaining or increasing funding for biking and walking. This support extends across all regions of the country, all age groups, and major political affiliations. 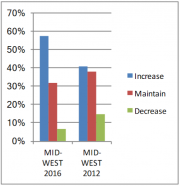 Support for bicycling and walking is increasing in the Midwest faster than any other region of the U.S.
Keep in mind that a Complete Streets policy does not mandate these or any other specific features. Rather, Complete Streets policies require full evaluation of the needs of pedestrians, bicyclists, transit users, and drivers of all ages and ability levels, evaluation of potential use and context, and use of national best practices and guidelines when providing for users of all types, in consideration of budget and right-of-way limitations. 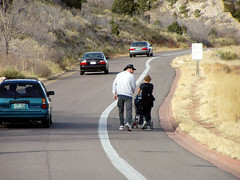 In short, Complete Streets says: Provide what is needed, where it is needed, to provide safety an access for all users. Complete Streets may look very, very different in the middle of a big city vs in a suburb vs in a small town vs in a rural area. Complete Streets is a philosophy of design of our roads, streets, and transportation system as a whole, not a set of specific requirements for every street or road. Over the past few years, Missouri has become a national leader in the Complete Streets movement. 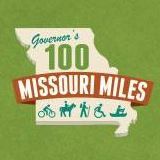 The state now has a large number of Complete Streets policies--policies adopted Missouri municipalities, including the largest county and six largest cities, cover more than 1.6 million of the state's residents, while policies adopted by Metropolitan Planning Organizations cover over half the state's population. In addition, Missouri's policies have been recognized as among the best in the nation--they are national models. We urge municipalities, planning organizations, and other agencies which have not yet adopted Complete Streets policies to carefully examine the many model policies adopted by Missouri municipalities and agencies, and start working for the adoption of their own Complete Streets policy. More about the progress on Complete Streets in Missouri--including the next steps for Complete Streets in Missouri at the city, county, regional, and state levels. HCR 23, a House/Senate concurrent resolution expressing the Missouri General Assembly's support for Complete Streets policies at all levels of government was adopted in May 2011. HCR 23 expresses support for Complete Streets and urges MoDOT, cities, counties, metropolitan planning organizations, and regional planning councils to follow Complete Streets principles and adopt Complete Streets policies. We are encouraging MoDOT to continue to work to adopt Complete Streets policy elements in in long range plan, its Engineering Policy Guide, the MoDOT Tracker, and its funding priorities. One of our major goals is for all funds under any new funding proposal for MoDOT to be spent under Complete Streets guidelines. Read the full text of HCR 23 here--it really makes the case for the importance of Complete Streets across Missouri, and it was approved by both Chambers of the Missouri General Assembly. More of specific goals for how MoDOT can better provide for the needs of bicyclists and pedestrians here. Find specific steps your community can take to become friendlier for bicycling and walking here. More than 3.2 million Missourians live in Metropolitan Planning Organization (MPO) areas that have adopted Complete Streets policies--over 50% of the state's population. Some MPOs cover areas of adjoining states, meaning that in total over 4.7 million citizens are covered by the MPO-level Complete Streets policies listed below. 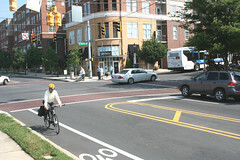 Complete Streets elements within the Long-Range plans are often found in the bicycle and pedestrian chapter of the plan. However, the most recent trend is to incorporate Complete Streets elements throughout the plans, in every chapter as appropriate. For example, the Policy Framework chapter of Mid-America Regional Council's Long-Range Plan mentions Complete Streets because it is an important part of the plan's "Accessibility" Policy Goal. Similarly, the chapter on Project Solicitation and Evaluation references the Accessibility Policy Goal, and thus the Complete Streets elements, because they are used as part of the project evaluation process. So nearly every chapter incorporates Complete Streets elements and outlook--though in ways that make sense in context and do not necessarily mention "Complete Streets" by name. Eight MPOs cover Missouri's larger metropolitan areas and nineteen RPCs cover the remainder of the entire state of Missouri. These regional planning councils set transportation policy and priorities for the regions they cover. You can find the list of all eight Missouri MPOs here and Missouri's 19 RPCs here. Those lists include links to contact information for your local MPO or RPC. Find a list of specific steps your local MPO or RPC can take to become friendier for bicycling and walking here. MoBikeFed's Vision of Bicycling and Walking in Missouri expresses our goal for Complete Streets in Missouri: Complete Streets policies adopted by the Missouri Department of Transportation and by every level of government that makes decisions about transportation planning and funding – cities, counties, regional planning councils, and metropolitan planning organizations. Congress is considering level legislation that would require Completes Streets policies be adopted by every state department of transportation and every metropolitan planning organization. H.R. 1780 and S. 1056 are the current bills in the House and Senate, respectively. More information here. For more information visit www.completestreets.org. Missouri Livable Streets is a coalition of organizations and agencies working together for Complete Streets policies and implementation at every level of government in Missouri. The Missouri Livable Streets web site has a large number of resources about Complete Streets in Missouri. Read the Missouri Livable Streets Advocacy Manual for many more ideas.